In March 2017, we ran our first European Ski School Off-Piste course in conjunction with TipTop Ski Coaching. I had already taught plenty of off-piste lessons, including off-piste courses for the Ski Club of Great Britain in Deux Alpes, but it was nice to be launching a new product for the ski school. This time it was me running the course so it was my decision what we did each day. We had a core group of three skiers for the course, completing all five days, while others joined us for a day or two. The most popular days were the trips to La Grave and St. Christophe en Oisans. The weather was fantastic all week, with sunshine every day. The snow was not so friendly. There was no fresh snow in the days leading up to the course, and freeze thaw conditions had transformed the snow all over the mountain. Getting good conditions was all about the timing, and we did find some great spring snow to ski on. We also found some ice, slush and wind-blown crud to play with. I wouldn’t normally seek out that kind of snow, but learning how to deal with it is a big part of skiing off-piste. We spent the first day working on our off-piste techniques staying close to the pistes. We also covered rescue techniques using avalanche transceivers. This is something I like to cover very early on when taking people off-piste. Day two was about skiing some longer routes and getting further away from the pistes. The La Fée sector is one of my favourite areas for this, and it has a great restaurant too. Wednesday was provisionally earmarked for our trip to La Grave. We arrived at the top of the Lauze T-bar to take the piste-basher tow across the glacier at about the same time as everybody else in the resort. The chaos here did not bode well for getting away from it all, but people soon dispersed and we had plenty of space once we were in La Grave itself. We followed the sun to get the best transformed spring snow and got some good turns on both the Vallons de la Meije and Chancel routes. One of the group made a great video of out the La Grave experience. On the second to last day, we stayed in Les Deux Alpes, tackling some steeper slopes in preparation for our plans for the final day. We found some quite challenging skiing high up in the Rachas area, and the most powdery snow of the week. 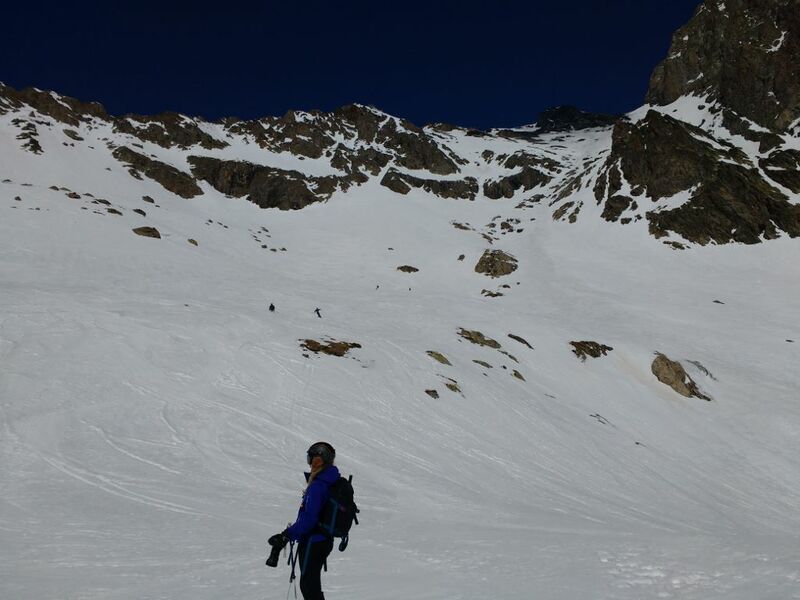 Friday was the day of our big trip down the Vallon de la Selle. This is one of the longest routes in the area and a personal favourite of mine. Wide open south facing slopes give some of the best spring skiing around Les Deux Alpes. The top section was as difficult as I have seen it. Thinner snow cover made the gully narrower than usual and the snow had formed into choppy waves. Once we had carefully negotiated this part, the slopes opened up and we were able to enjoy ourselves. The route feeds into a long valley leading to the road above the village of St. Christophe. From here it was skis off for a twenty-minute walk down to the village and a well-deserved late lunch. As an instructional course, rather than simply a guided one, the aim is to teach people as much as we can about off-piste skiing. 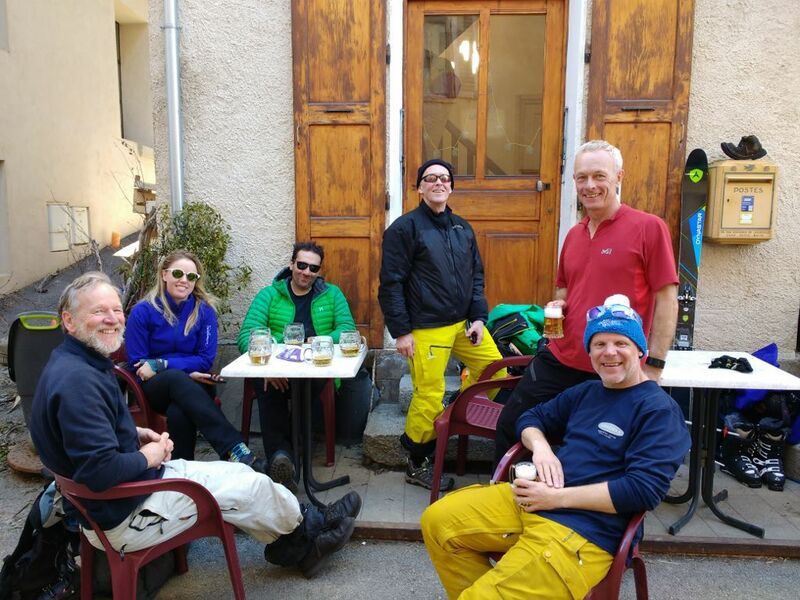 This is not just about skiing technique, although we do cover that in some detail, but also about safety awareness, avalanche forecasts, snowcraft, rescues, route choice and the mountain environment. Looking back, I thought the course was a great success. I am really looking forward to running the next one in March 2018. With a maximum group size of six, we can ensure plenty of instructor time in a relaxed atmosphere. This does mean that spaces are limited though, so please get in touch if you are interested in coming along next year.